The burner will blow out regularly at 2 bar, and occasionally at 1.5 bar. Best running seems to be at 1.0-1.2 bar (14-17psi), above which it runs rough. I used a little forced air from a hair dryer, it seemed to push the temperature up considerably in the furnace. The jet hole is 1.0mm, which cross-refs to an American #60/#61 drill bit, which Lionel Oliver has stated on his pages will cause problems. The correct size is #57 which is roughly 1.1mm. 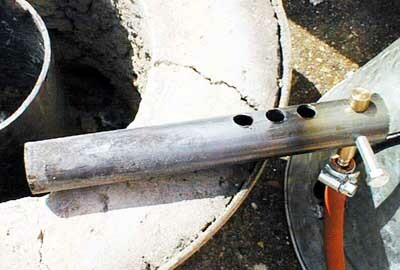 Use some pipe fittings as the incoming gas pipe is a little too close to where the action is. Re-drilled the hole to 1.2mm (I don't have a 1.1mm drill bit), the burner needs a lot less pressure to run. It will still blow out if you get greedy with the gas. The Weber jets turned out to be a no-no as most of the jets I had were way too big. It works really well for melting aluminium, much more convenient than charcoal. I don't think it will produce enough power to melt cast iron or steel (not quickly anyway), so I'm going to supplement it with a Monster Burner. While doing a melt a couple of days ago, there was a strong smell of unburnt propane coming out of the exhaust. After 21 minutes, I decided to look down the hole. This was a mistake as the furnace had now got hot enough to light the propane coming out of the top! Using the small hair dryer about 12" away from the burner caused the foot long flame to drop down to half the length. Inching the hair dryer closer until the flame was completely burning in the furnace, it became apparent that the output from the burner was too rich. I have not drilled the holes in the right place, and this is probably the cause of the problem. 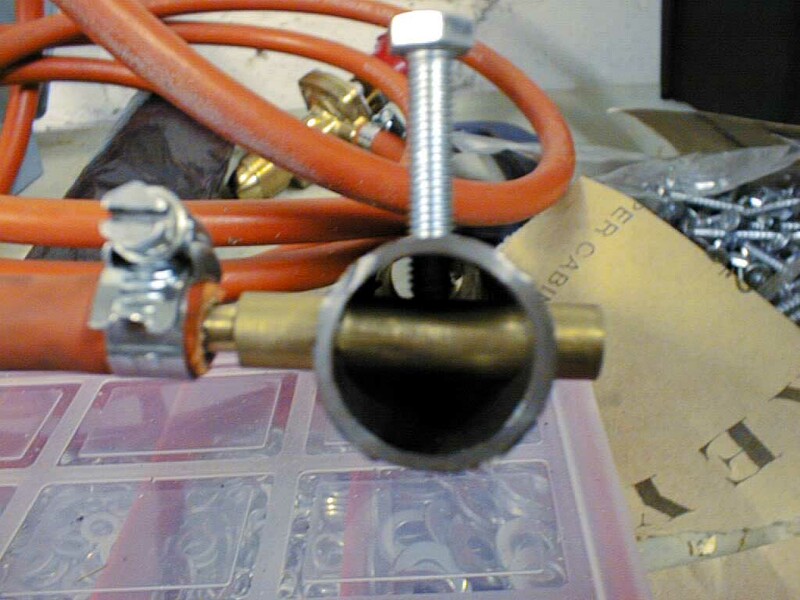 If time permits over the weekend, I can make a new burner tube and hope to see an improvement in the mix ratio.